The Isle of Portland measures four miles long by one-and-a-half miles wide and is composed mainly of limestone. Records show it has been permanently settled since the 13th century. Before then the Romans had a base here and they named the Isle Vindilis. 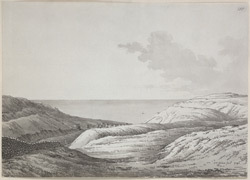 They chose the highest point on Verne Hill to erect their massive ramparts and ditches, which looked directly over the large natural harbour and onto much of the Dorset coast and out to sea. They were the first to quarry the famous stone on a large scale and remains of stone sarcophagi have been found in the surrounding areas.